America’s largest dinosaur ride is returning to the Bronx Zoo this spring, and it’s going to be bigger than ever before. Dinosaur Safari will run from April 19 to November 3. It will feature 40 life-size animatronic dinosaurs, including two 40-foot long Tyrannosaurus Rexes. 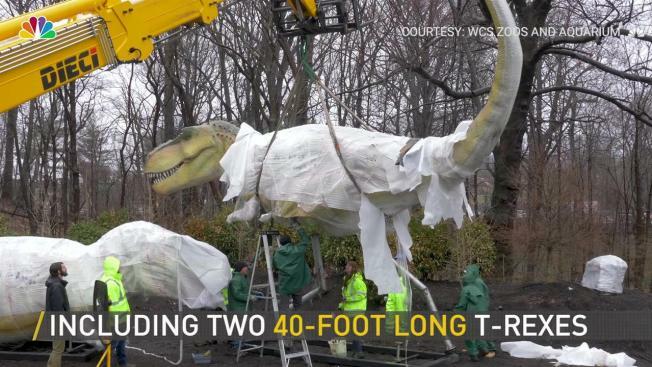 They may have been swathed in plastic, but the silhouette of the T-Rex -- one of most ferocious predators to stalk the earth -- was unmistakable as it arrived at Bronx Zoo over the last week. The zoo filmed sneak-peek footage of the stars of “Dinosaur Safari,” America’s largest dinosaur ride, as they arrived in trucks, wrapped in plastic, and were placed around the zoo. “Dinosaur Safari” opens April 19 and will be more than double the size of past years' exhibits. It will feature 40 life-size animatronic dinosaurs, including two 40-foot long Tyrannosaurus Rexes. Visitors will be able to take a guided safari ride through the dinosaur-filled forest, dig up fossils in interactive exhibits and take some scarily realistic photos. Over the summer, Dinosaur Safari will host several themed events, including Legoland Dinosaur Week and Birds in Flight, where you can meet some dinosaur descendants. The Bronx Zoo will also host Dinosaur Day on June 1-2, where there will be a parade and other fun festivities. Dinosaur Safari will run until Nov. 3.